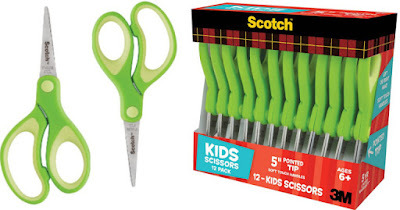 Hop on over to Amazon where you can snag this Scotch Kids 5″ Pointed Scissors 12-Pack for just $6.71 (Retail $15.53) - That’s only 66¢ per pair! These kids scissors have a pointed tip and soft touch handles, perfect for kids ages six and up. Consider picking up a pack for your kiddo’s classroom as a teacher gift, or storing at home for craft projects.